අපි දැන් බලමු කොහොමද home automation system එකේ sensor unit එක හදාගන්නේ කියල.අපිට මේකට පහත උපකරණ ඕන කරනවා. ඉහත රුපයේ විදිහට modules ටික එකට එක සම්බන්ද කරගන්න ඕනේ. Arduino Board එකේ GND pin එකට GND connectකරගන්න. RF Transmitter එකේ Data pin එක Arduino Board එකේ D2 පින් එකට connect කරගන්න. RF Transmitter එකේ VCC pin එකට 5V connect කරගන්න. RF Transmitter එකේ GND pin එකට GND connect කරගන්න. පලවෙනි PIR sensor එකේ Data pin එක Arduino Board එකේ D3 පින් එකට connect කරගන්න. දෙවෙනි PIR sensor එකේ Data pin එක Arduino Board එකේ D4 පින් එකට connect කරගන්න. තුන්වෙනි PIR sensor එකේ Data pin එක Arduino Board එකේ D5 පින් එකට connect කරගන්න. හතරවෙනි PIR sensor එකේ Data pin එක Arduino Board එකේ D6 පින් එකට connect කරගන්න. පස්වෙනි PIR sensor එකේ Data pin එක Arduino Board එකේ D7 පින් එකට connect කරගන්න. හයවෙනි PIR sensor එකේ Data pin එක Arduino Board එකේ D8 පින් එකට connect කරගන්න. හත්වෙනි PIR sensor එකේ Data pin එක Arduino Board එකේ D9 පින් එකට connect කරගන්න. 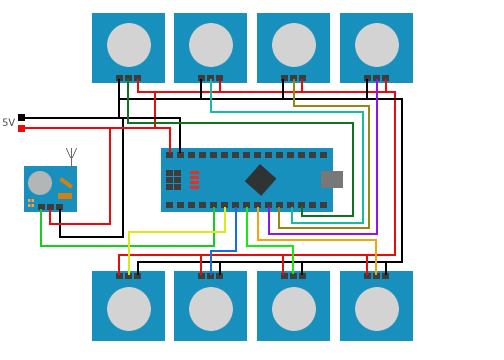 අටවෙනි PIR sensor එකේ Data pin එක Arduino Board එකේ D10 පින් එකට connect කරගන්න. අටවෙනි PIR sensor එකේ GND pin එකට GND connectකරගන්න. හරි දැන් පරිපථය හදාගෙන ඉවරයි.අපිට දැන් තියෙන්නේ මේ PIR sensor එකක් එක කාමරයකට / ස්ථානයකට බැගින් ස්ථාන/කාමර 8ක පිටතට නිරාවරණය වෙන පරිදි සවි කරගන්න. ඊට පස්සේ software එක install කරගත්තට පස්සේ ඒ files ටික නැවතත් C:\HBSN කියන folder එකට copy කරගන්න.නැත්තන් ඔයාලට සිද්ද වෙනවා software එකේ කලින් දීල තිබ්බ commands වගේම ඔක්කොම settings නැවතත් හදන්න. මෙතැනදී Control_Unit.ino කියනsketch එක main control unit එකට upload කරගන්න.ඒ වගේම Sensor_Unit.ino කියන sketch එක sensor unit එකට upload කරගන්න. දැන් වැඩේ ඔක්කොම හරි දැන් තියෙන්නේ unit දෙකටම power-up කරලා වැඩ ගන්න.